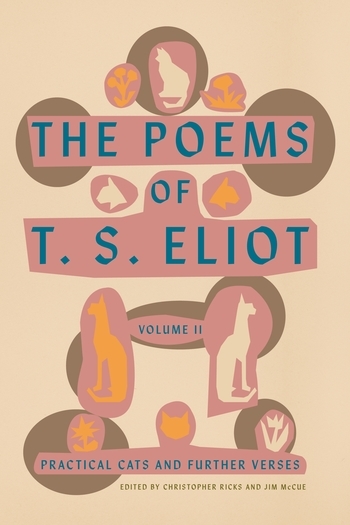 This two-volume critical edition of T. S. Eliot’s poems establishes a new text of the Collected Poems 1909–1962, rectifying accidental omissions and errors that have crept in during the century since Eliot’s astonishing debut, “The Love Song of J. Alfred Prufrock.” In addition to the masterpieces, The Poems of T. S. Eliot contains the poems of Eliot’s youth, which were rediscovered only decades later; poems that circulated privately during his lifetime; and love poems from his final years, written for his wife, Valerie. Calling upon Eliot’s critical writings as well as his drafts, letters, and other original materials, Christopher Ricks and Jim McCue have provided a commentary that illuminates the imaginative life of each poem. Following the collected and uncollected poems of the first volume, this second volume opens with the two books of verse of other kinds that Eliot issued: the children’s verse of Old Possum’s Book of Practical Cats, and Anabasis, his translation of St.-John Perse’s Anabase. This volume then gathers the verses that Eliot contributed to the learnedly lighthearted exchanges of Noctes Binanianæ, and others that he wrote off-the-cuff or for intimate friends. Each of these sections is accompanied by its own commentary. Finally, pertaining to the entire edition, there is a comprehensive textual history that contains not only variants from all known drafts and the many printings but also extended passages amounting to hundreds of lines of compelling verse. Thomas Stearns Eliot was born in St. Louis, Missouri, in 1888. He moved to England in 1914 and published his first book of poems in 1917. He received the Nobel Prize in Literature in 1948. Eliot died in 1965. Sir Christopher Ricks is the William M. and Sara B. Warren Professor of the Humanities at Boston University, having formerly been a professor of English at Bristol and at Cambridge. He is a member of the Association of Literary Scholars, Critics, and Writers, of which he was president (2007–2008). Jim McCue, a former editor at The Times, is the author of Edmund Burke and Our Present Discontents and the editor of Penguin Classics' Selected Poems of Arthur Hugh Clough. His imprint, the Foundling Press, began with the first separate publication of T. S. Eliot’s Eeldrop and Appleplex and has printed for the first time writings by Alexander Pope, Ben Jonson, Henry James, and A. E. Housman.